This is truly a summer feeling. I just received a comment from my friend in facebook that it is very hot outside. The current temperature outside is 27 degree Celsius or 80.6 Fahrenheit if I am not mistaken. Inside our house, we are having 20 degree Celsius which a very comfortable temperature for me. Summer time is the time of the year when I think like staying in the water. Thus, I always remember home for this. 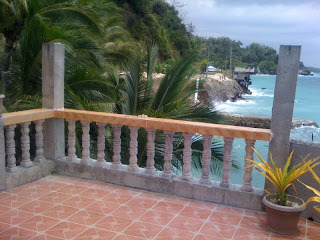 Our house near the beach, I can imagine that I am there at the moment. We never expected that we can built a house along the beach. The project started some time in 2004 and from time to time it is standing now some meters away from the sea. Here are some images of our house and its story. As far as I can remember, there was really no right plan for that beach house. I was not there when it was started. I just told my Uncle who is a carpenter that I wanted to build a small house with two bedrooms, a kitchen and a living room. That is enough for us to stay especially when we go for a vacation in the Philippines. I never expected that the house was built double-size as really planned. That was also the reason it took us some time to finish it. At least, we don't have a loan or credit for this project. the huge terrace facing the ocean. I wish I am here right now enjoying the water and the sunshine. Since the house is located along the beach, I always wanted sash windows for it especially the ones facing the sea. Since I was not there again during the installation, I did not knew that my brother already decided for sliding glass windows. It looks great anyway and perfect for a house near the water. The doors were all made with hardwoods and I love the carvings on it. Sometimes it is difficult to decide on these things considering the material, style and money. The house is quite furnished now. When I went home last year, I bought a set of dining table, living room set and a bedroom set. It cost some fortune but I am happy and contented now of how the house looks. I still need more furniture but I will buy it in our next vacation there. the ceiling in the dining room. Special thanks to my dear brother who takes care of the house. He loves to hang beautiful curtains in all of our sliding glass windows. He also bought some house decors and accessories when I went home last year. Some paintings are already hanging on the walls. Porcelain and crystal decors are also displayed on the living room now. still needs more improvements but it is a dream come true when this house was built. This is where we plan to retire in the future. Until now, there are still some improvements going on. The seawall is still not done. The huge terrace facing the sea still needs some lifts and finishins. In one or two years maybe, everything will be in order already. 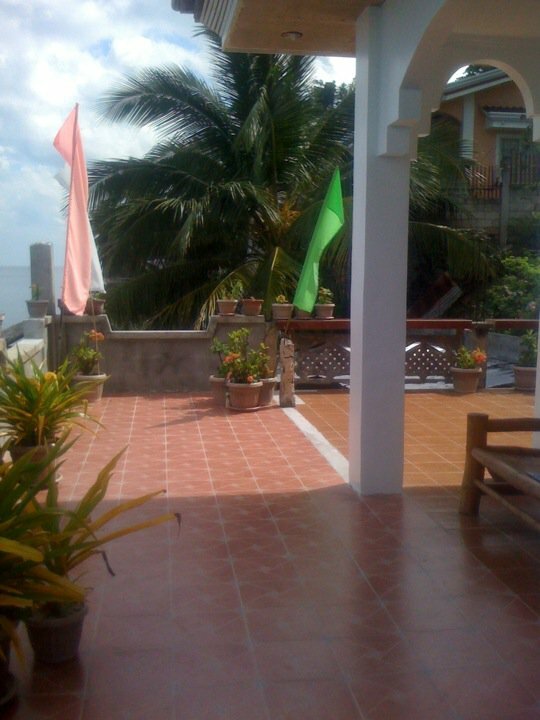 At least, we have a house that we can call our own...a house along the beach..I miss this beautiful place!